If you would like to take things up a notch, then we would suggest you program Sensything using the ESP IDF. This section is intended to help users set up the software environment of applications using Espressif ESP32. Through a simple step-by-step process to illustrate how to use ESP-IDF(Espressif IoT Development Framework). Besides the toolchain (that contains programs to compile and build the application), you also need ESP32 specific API / libraries. They are provided by Espressif in ESP-IDF repository. To get it, open terminal, navigate to the directory you want to put ESP-IDF and clone it from espressif repository in github. Since this sensor has a high sensitivity and fast response time, it can be used as a portable gas and smoke detector suitable for detecting H2, LPG, CH4, CO, Alcohol, Smoke or Propane. MQ2 is a semiconductor sensor for Gas Detection. When we apply a bias to the sensor it takes some “burn-in time” that is for to sensor getting warm, after that the electrochemical sensor detects specific gas and varies the current flow through the sensor. Hence we get analog output ranges depends on Gas concentration. It has very high sensitivity and fast response time, The voltage measured from ads1220 in Sensything and converted to the sensor voltage and gas concentration is calculated. The concentration of gas is sent through BLE and displayed in the Sensything mobile application. - Place the etape MQ2 gas sensor to any of the analog pins A1, A2, A3 and A4. - Here we are using A1. 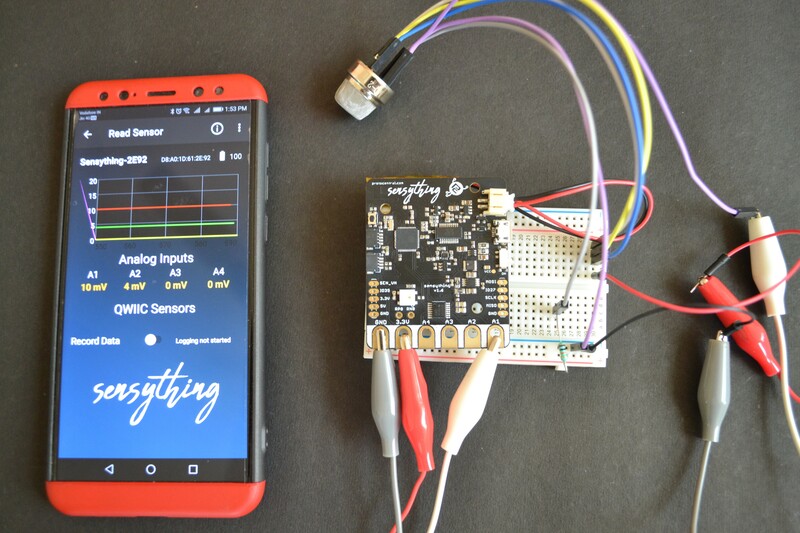 - Using a breadboard connect a pin A, pin H, pin A1 to Vcc in Sensything. - Connect pin B of MQ2 with Analog1 in Sensything. - Using a breadboard connect a resistor between pin B1 in sensor and GND in the breadboard. - Connect GND across the resistor from pin B1 with the GND pin in Sensything.